Beautiful Californian Style Beach House - Salt Rock Accommodation. 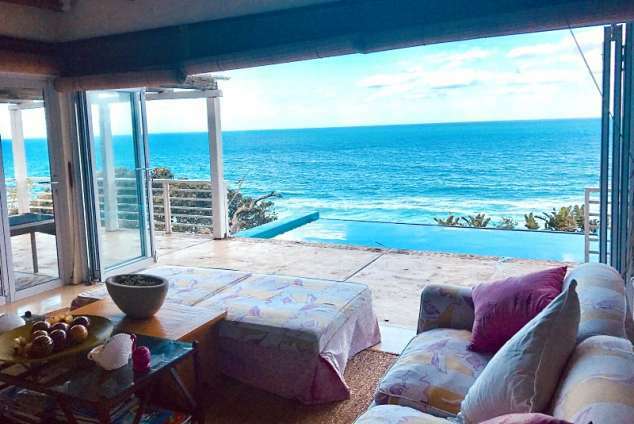 Beautiful Californian style self catering beach house over looking the Indian Ocean. Private path leading you to a secluded quiet beach. The main en-suite bedroom is on the upper level, two bedrooms on the lower level. The one bedroom has two single beds and the other has a King size bed. The mezzanine level also has two bedrooms, the one with two single beds and the other with a King size bed. Three of the bedrooms are sea facing with stunning views of the Indian Ocean. Each floor has a bathroom (3 bathrooms), all have a shower and toilet with two of the bathrooms having a bathtub. The house has satellite TV (dstv) and also has WiFi. The shopping centre is two kilometers away, where you can buy food and essentials, and also has a number of restaurants to choose from. Domestic Worker: Monday, Tuesday, Thursday and Friday. 1246 page views since 30 Oct, 2018. Last updated on 02 Nov, 2018.